Tony Sholar of the Marine Corps stands in the abandoned headquarters of a Marine unit at Camp Lejeune, N.C. 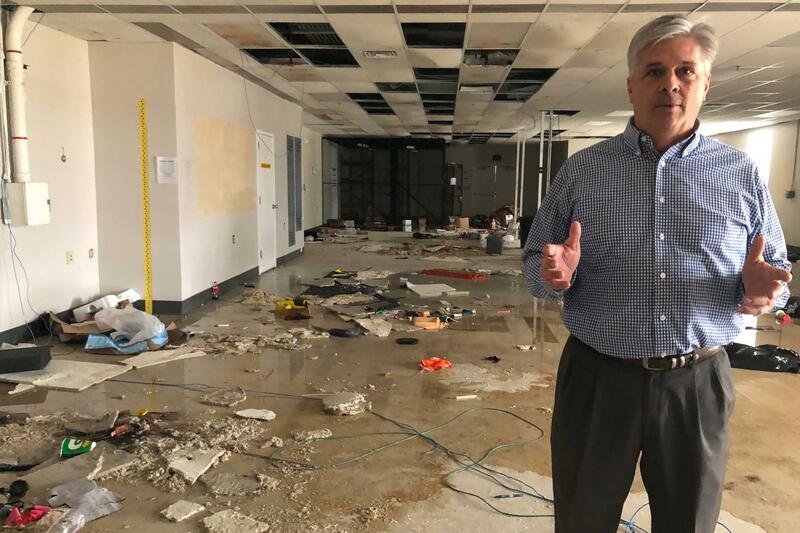 The building was damaged in Hurricane Florence, and rainwater still pours through damaged roof. 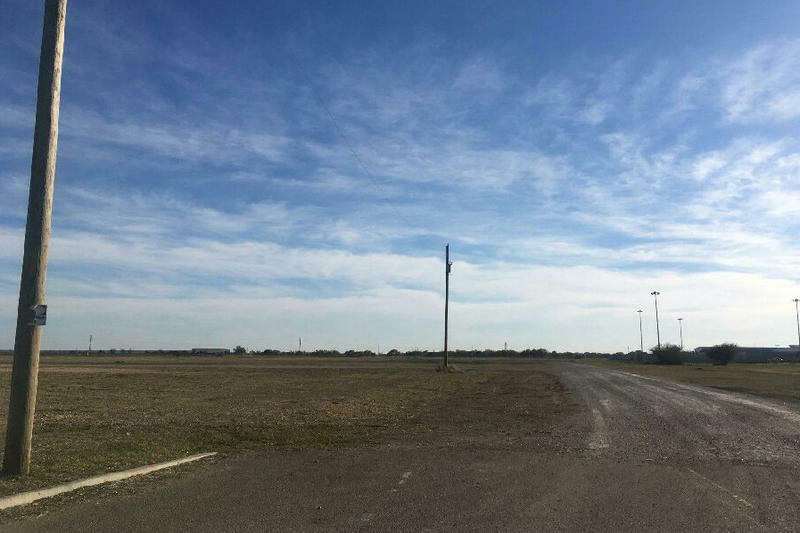 Jay Price reports that massive hurricane damage at military bases may become common. The final tally is in for the damage that Hurricane Florence wreaked on the Marine Corps' Camp Lejeune, N.C., and the number is startling. '"The total bill comes to $3.6 billion dollars," the Corps' top officer, Gen. Robert Neller, told the Senate Armed Services Committee in December. In the four months since the hurricane, the extraordinary amount of damage to the main East Coast Marine base hasn't received much attention, in part because it may not look spectacular from the outside. The most visible sign is dozens of blue tarps, draped over roofs all over the sprawling base. Tony Sholar, a civilian with the command that oversees East Coast Marine facilities, said the damage is obvious, though, to anyone who knows about maintaining and repairing older buildings. Touring the now-abandoned headquarters of the 24th Marine Expeditionary Unit, he pointed out some of the signs of damage inside walls, between floors, and to doors. 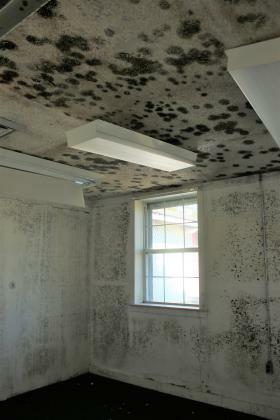 Before it was determined that fixing it would cost more than three-quarters of its replacement cost, teams of Marines had dried out the building. But after a recent overnight rain, there were pools of water again. "Clearly the roof still has some leaks in it, and last night's rain would have leaked some more in," Sholar said. There are two big reasons the damage tally is so high. The first is the age of the buildings - many are three quarters of a century old. Like nearly 500 other buildings on the base, the abandoned headquarters was built in 1940s. Many of the damaged buildings are nearing the end of their service life and were built to lower standards. The other big reason for the damage was the extraordinary nature of the hurricane. The huge, slow-moving storm first damaged hundreds of roofs on the base, then dumped water inside the buildings for three days. And it was a lot of water: the town of Swansboro, N.C., not far from the base, recorded the all-time state record for rainfall during a tropical storm, more than 30 inches. All told, 70 buildings on base need major renovations and about 130 will have to be replaced, the Marine Corps said. Among them is the main headquarters for east coast-based fighting forces, which was built in 1942 as a hospital. The H1 building, as it's called, is the headquarters for the Second Marine Expeditionary Force and the Second Marine Division. The building is huge, with more than a dozen separate wings, which was typical of large hospitals in the 1940s. It has 375,000 square feet of space inside - about as much as four large strip malls. It's damaged so badly that it will have to be torn down, said Maj. General Vincent Coglianese, who oversees all Marine Corps facilities. The replacement will be built to a higher standard, making it more resilient in storms, he said. It also will be much more efficient and will be moved back from the current location on the waterfront of the New River. It won't be cheap to replace, but the Marines say they have little choice. Fixing it would cost nearly as much and leave them with a building that doesn't work well. Climate experts say Congress should be prepared to pay for a lot more storm damage to crucial bases. "The impacts on Camp Lejeune from Hurricane Florence are really an indicator of what we're going to continue to see into the future," said Shana Udvardy, a climate resilience analyst with the Union of Concerned Scientists. "What we know with climate change and global warming is that we're going to see more extreme weather events, and this means more powerful storms, more rising seas, and heavy rainfall events," she said. Udvardy was one of the authors of a 2016 report that underlined threats that climate change - especially sea level rise - pose for U.S. military bases including Lejeune. Other bases, including Parris Island, S.C., Naval Air Station Key West, Fla., and the world's largest naval base in Norfolk, Va. face even greater, and sooner, risks from rising seas, in part because Lejeune is protected by a barrier island. "What the military already knows is that climate change indeed is a national security threat," Udvardy said. "We're very concerned, as is the Department of Defense, on how we can continue to ensure readiness in a world of changing climate." That likely means measures like rebuilding crucial structures higher and raising sensitive equipment so it can't be damaged by flooding. Coglianese said the Marines definitely want to see those sorts of changes as they rebuild. "We want that resiliency built into the bases so going forward," he said. "We want to make sure that we build a buildings that not only last but have the resiliency to withstand the storms and other natural disasters." At Camp Lejeune, nearly 4,000 Marines are displaced from their workplaces on base. Some are working in temporary trailers. The base secured 61 trailers despite high demand from the private sector, which also was looking for temporary space. Another 140 are on the way. In base buildings that survived the storm, two or three units are packed into space designed for one. On cold days, Marines wear coats indoors because the moldering insulation was ripped out of ceilings and walls. "Things that normally take an hour take two to three hours to do," said Col. Brian Wolford, the chief of staff for the 2nd Marine Expeditionary Force or "MEF." Not included in Neller's $3.6 billion cost estimate are hundreds of on-base homes still being fixed. Marines transferring to the base are being told to leave their families behind if they can't find suitable housing. And it's not just buildings that were damaged. 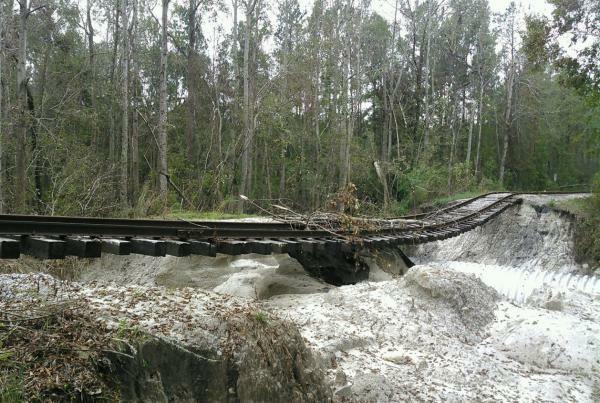 A Marine-owned rail line that ships heavy equipment on and off base is still unusable. A swing bridge over the Intracoastal Waterway to the barrier island where the Marines do their signature amphibious assault training needs to be replaced. And the training beach itself was partly washed away, speeding up natural erosion that the Marines had been monitoring for years. Leaders say the damage means that the Marine Corps can't be as effective or ready as it should be. "Operationally, the MEF is back to work. We have a mission to accomplish," Wolford said. "But we're doing it in suboptimal conditions." Jury selection is set to begin for the second trial of a Florida man accused of killing a Georgia teenager during an argument over loud music outside a Jacksonville convenience store. 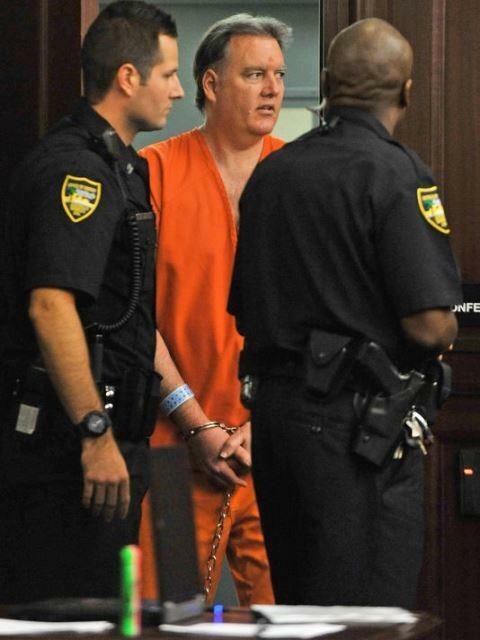 Attorneys for 47-year-old Michael Dunn want to move the trial away from Jacksonville, citing widespread publicity about the case. Circuit Judge Russell Healey has said he'll decide whether to move the trial during jury selection. Earlier, jurors found Dunn guilty of attempted second-degree murder and firing into an occupied vehicle. They deadlocked on the first-degree murder charge. Facing a shortage of pilots, the Air Force is experimenting with ways to make training programs faster and less expensive.